Ummagawd Remix Arms - CCW + CW by tommytg is licensed under the Creative Commons - Attribution license. Broken your Ummagawd Remix arms, the replacements are out of stock and you're a bored engineering student? Same! I have designed these to be printed in PETG and to be almost the exact same shape as the originals. They are obviously much thicker than the 4mm CF arms but the motors are depressed so the thrust plane doesn't change. 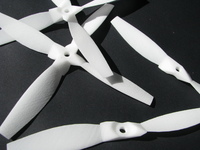 They are rigid enough for flight and should take a decent crash before breaking. You will need M3x16mm arm bolts and M3x10mm motor bolts for it to work. I broke the thinnest prong off while cleaning up the print but it makes no difference. It does help it print better but feel free to get rid of it for assembly. I used a brim and supports everywhere for best results. Say thanks by giving tommytg a tip and help them continue to share amazing Things with the Thingiverse community.